Here Comes Ingo, a beautiful visual story that encourages parents to “pause” and use story-time as a memorable bonding experience with their little ones, exemplifies a progression of thinking leading toward love, kindness and inclusion. Page after page of hand-crafted collages filled with fun details and wrapped in Disney-like colors encourage children to resist feeling discouraged in front of the unexpected or the unknown. Much like Ingo, they are to rely on their own ability to embrace what at first may seem strange & confusing. Young readers are invited to put their thinking hats on and figure out what the characters are thinking, feeling and doing thus gaining valuable skills such as predicting, inferring, reasoning, sequencing and attention to detail. Most importantly, what sets this picture book apart is the ability to present children with fairly sophisticated art concepts such as figurative art collage in a relatable way. 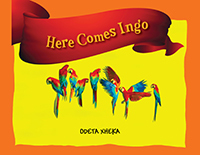 Each page lures pre-schoolers (3-5) and school age children (5-8) into immersing themselves further into Ingo’s dream world by adding their own ideas and expanding on the story as far as their imaginations takes them via drawing, coloring and painting directly ON the page. As with the best of books, at the conclusion of the story, the journey is not over. Ingo invites children to visit again and again following into the tradition of classic books such as Good Night, Gorilla, The Adventures of Polo, Tuesday, Where's Walrus, Sea of Dreams and The Red Book. Having a sense of meaning and purpose is key to a thriving life. Busy raising her children and nurturing her art practice, Odeta Xheka is very fortunate to make her passion the driving force in her life.